Dear RpscGuru experts readers in every competition exams Computer Parts is plays major role in the paper. In this post we will shared 20 most important MCQs with answer for Computer Fundamentals. 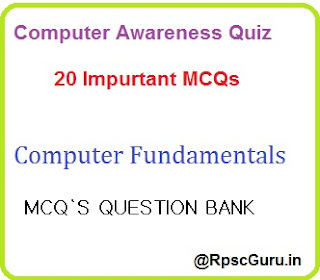 In RPSC JR Accountant and TRA Exam their are asking 25 Computer Knowledge questions and after read our all Computer Quiz you are able all 25 questions correctly. 19. A set of tracks across a set of platters in a hard disk is called a……………. 20. Software’s used for layout of newsletters and magazines along with text and images are called…………..